You are here: Home / Beekeeping / Propolis – Your Sticky Medicinal! After opening the brood boxes, you notice the bees have glued the frames solid. When this occurs it sometimes can be difficult to do a quick inspection, but for the bees propolis is a vital substance and their first line of defence against infections and other pathogens. From Hellenistic ancient greek the meaning of propolis means suburb. Propolis can be seen as a glue that builds and extends the hive together. 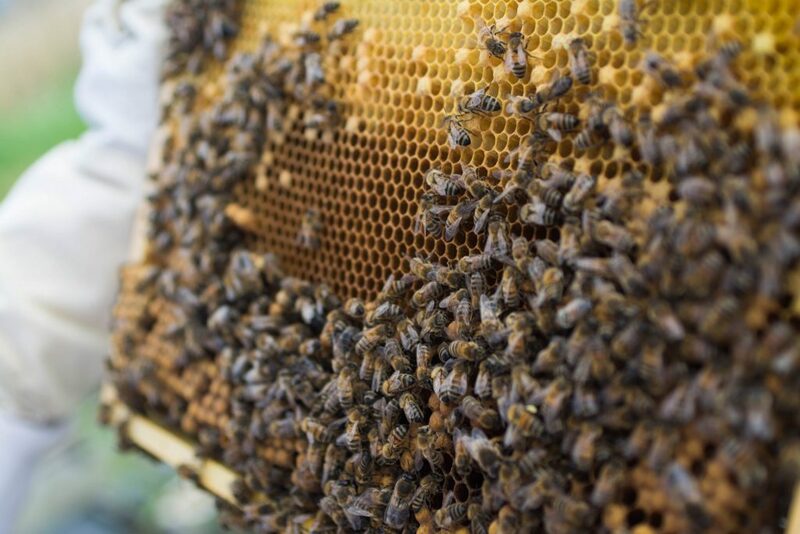 If new born bees hatch from their cell the worker bees clean the cell and wax it with a thin layer of propolis. This strenghes the comb and disinfects the cell. It serves a major role in closing gaps and holes in the hives to avoid any unwanted ventilation. In cold winter’s when mice intrudes the hive to find shelter and warmth. There will be a big change the bees do not tolerate the intruder and will sting it to death. After which it is balsamed with propolis to avoid any further health thread. Propolis in a hive is effective against bacteria, fungi and viruses. A great benefit that also benefits humans. In traditional medicine propolis is used as anesthetic. Further propolis is known to benefit skin diseases, infections, can lower blood pressure and is able to calm down seasonal allergies. Propolis has many other benefits and research is still ongoing to discover more amazing unknown facts. In human history propolis is also used in ancient medicine, the greeks and romans used it as medicine to treat for most infections and skin diseases. In those days of the earliest civilizations, it was really wondrous to see somebody heal from a substance the bees gave to them. The honey bee in return gathered a god like status. The romans and the old egyptians worshipped the bees like gods. The pharaos were balsemed with a paste partly made from bee propolis and in the roman mythology the god jupiter changed the beautiful melissa into a bee so she could harvest the propolis. Resin comes from woody plants, when the plants are injured they produce resin to keep off pathogens and fungi from entering the vulnerable plant. Plant buds are often also covered with resin. The resin is bitter for predating insects or animals, so the tree is not being eaten. Resin consist also for a big part of flavonoids, the flavonoids play a major role in pigmenting the bud or flower which benfits in both ways. Keeping of predators and attracting pollination. There are many different variaties of flavonoids and they all play a different part in the plant functioning. Flavonoids are the beneficial compound in herbs. In plants the concentration of flavonoids is only 0.05 till 0.15 percent. In propolis the percentage is much higher and close to 15 percent. Flavonoids serve as anti oxidant in our body, which neutralise any free radicals that could be harmful. Some flavenoids which are located in propolis do not come from trees. This means bee add something to the propolis which create some unique flavenoids, it is unfamiliar what. Propolis is harvested in colder periods, in early spring or autumn/ winter. When it is warm the propolis has a tar like substance, very sticky and viscous. When it is colder the propolis is very brittle and is easily harvested. Buw how do you harvest propolis? There are two easy ways to harvest propolis. The first method; we use a propolis trap which is put on top of the hive. The trap is a plastic sheet with a grating structure. Between the top of the hive and the propolis trap a gap needs to be left, for ventilation to take place through the propolis trap. The bees do not like the extra ventilation and start to put propolis on the trap to minimize the extra ventilation. The amount of time used for the trap differs a few weeks to couple of months. Some beekeepers let the trap on top for the whole season, but be sure to have it only in warmer periods and remove it when the beekeeping season ends. When finished, the traps can be frozen or laid outside in the winter and the next day it can be harvested. A second method; can be used when you do not have a propolis trap available. Bees use propolis to enforce certain part of the hive. Bees will seal the brood boxes together and they strengthen the hive frames with propolis. In such cases propolis is build up and can be easily cleaned in colder temperatures. Just scrape the propolis from the corner of the frames and collect it in a jar. When done harvesting always be sure the propolis is clean and does not have any bee remainings and wood chips/ residue in the propolis. You can store the propolis in a cold dark place. You can also freeze the propolis then it can be easily used in the future. Raw propolis; can be bought in granular or powder form. Raw propolis is not processed and is only cleaned of impurities. Some people prefer this product because it is possible to make your own tincture, lip balm or any other product of your choice. The best thing is you can choose where to get your propolis from. If you do not keep bees, just get in contact with a local beekeeper and ask him about propolis. A lot of beekeepers discard the propolis as unwanted. By asking you can get propolis for free or at bargain prices. Propolis Tincture; My preferred choice is the alcoholic based propolis tincture. it can be used as a energy booster and to ease a sore throat. Available in different part of propolis percentages, I prefer alcohol because in addition it is possible to disinfect wounds. Alcohol free propolis tincture; is a concentrate were instead of alcohol, glycerine is applied to extract the beneficial compounds from propolis. Glycerine is used in the food industry as an artificial sweetener and is safe to consume. Propolis Tablets; is raw propolis mixed with a filler and pressed into tablets or put into capsules. Easy to combine with additional vitamins and other dietary supplements. Propolis balm; can be used against skin irritations. Also has disinfecting properties and can be used to treat light skin irritations. DISCLAIMER: Always read the provided information that comes with the product or contact your doctor for advice. I’m a huge fan of DIY. I’m privileged to experience making tincture from hive to end product and I appreciate the hard work the bees have done to deliver my tincture. And you can make in bulk which result always in a good present to give away to your friends and family. Please find below my simple recipe for making propolis tincture. First determine the ratio of propolis you want. This will determine the amount of propolis and alcohol required. for this example we will prepare a 30 percent tincture, we will need 30 percent propolis and 70 percent alcohol. The alcohol has a percentage of 96 and not 100, but those 4 percent are negligible. Weigh down 30 grams of propolis; ground them to a fine powder. Be sure the propolis is frozen for easy grouding. Take your screwed jar, open it and add the propolis and alcohol. And close it with the lid. Let it sit for a couple of days and shake it daily. I let it sit for 3-4 days. Take the cone holder and coffee filter and place it above your bowl. Take your jar and empty it in the coffee filter. It should filter through into the bowl. Empty the bowl into the brown pipette bottle and you finished your tincture! Congratulations! you made your own tincture. Daily dosage is 2 times 5 – 10 drops. It can be consumed oral or you mix it with some honey before consumption. Propolis is the glue of the bee hive, it gives strenght to the comb and seal any unwanted gap. Propolis is the natural anti bioticum for bees. it prevents against fungi, bateria an viruses. Flavonoids can be beneficial for human health, it serves as a powerful antioxidant and the concentration in propolis is higher than in other plant species. Several product are available on the market. Depending for your own preference there is always something for you. Take a visit to your local beekeeping club and find out what is available if you want to buy local propolis. So I invite you to experiment with propolis for your health. It is recommended to first try out a bought product and you can get familiar with it before you start making your own products.